Laparoscopy is a surgical procedure that allows the doctor to look at the uterus, ovaries, and fallopian tubes. If any problems are diagnosed, the doctor can sometimes correct them during this surgical procedure. Laparoscopy can help the doctor diagnose fibroids, scar tissue (adhesions), endometriosis, and blocked fallopian tubes—all of which can cause infertility. 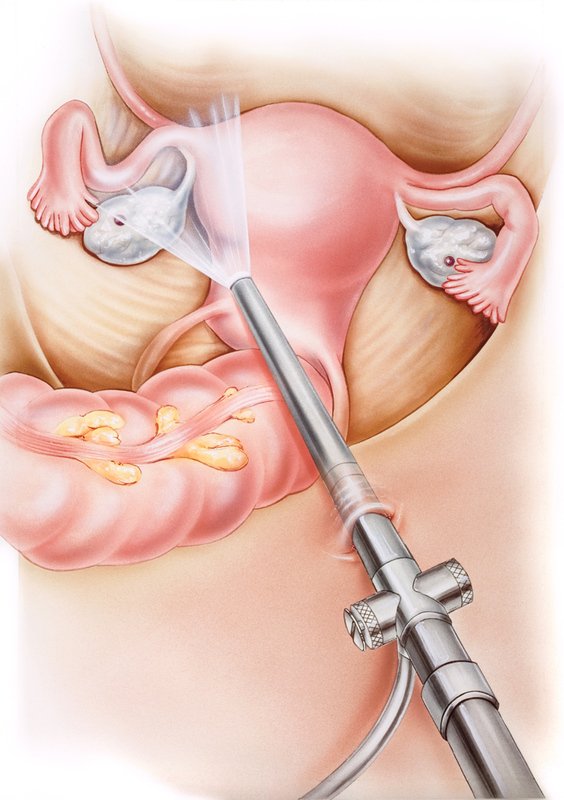 Using a narrow, fiber optic telescope (called a laparoscope) inserted through a tiny incision near the navel, the doctor can examine your ovaries, fallopian tubes, and the outside of the uterus. Laparoscopy is a surgical procedure performed under general anesthesia, so it is usually done in a hospital or surgery center. Once under anesthesia, the doctor will insert a needle and inject a harmless gas into the abdomen. The gas raises the abdominal wall so that the doctor will be able to see the reproductive organs more clearly. The needle is removed and the laparoscope is inserted through a tiny incision. Another small incision is made in the lower abdomen so that the doctor can insert a probe. The probe is used to move or lift the organs to see hidden areas. Also, a dye may be injected through the cervix into the uterus and fallopian tubes to see if they are open or blocked. If the doctor sees a problem, it may often be treated at this time with a surgical instrument that is inserted through another small incision made in the lower abdomen. The risks of laparoscopy, although uncommon, include injury to the bowel, bladder on blood vessels.